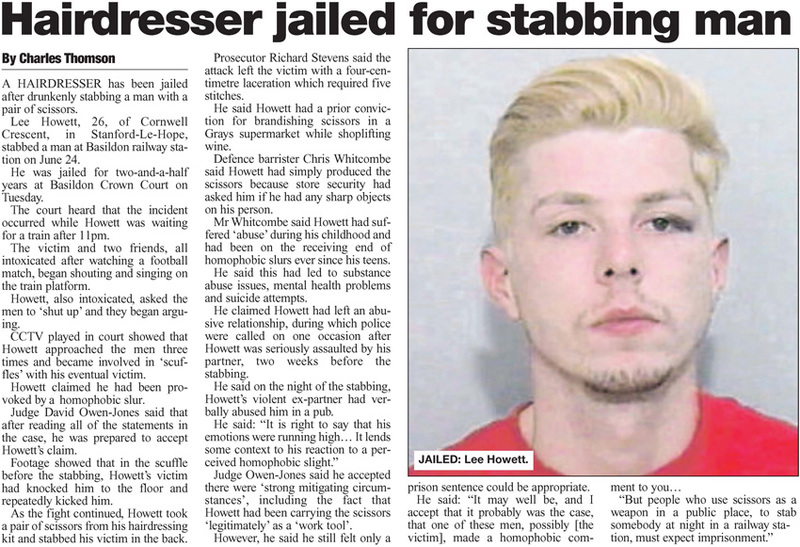 Charles Thomson: Gay Hairdresser Stabbing; Has copy & paste journalism turned an aggressor into a victim? Gay Hairdresser Stabbing; Has copy & paste journalism turned an aggressor into a victim? On Tuesday morning I made my way over to Basildon Crown Court, as I often do. I had been following the case of Lee Howett, a 26-year-old man from Stanford-Le-Hope in Essex, since his first appearance at Basildon Magistrates Court on Thursday, August 23rd. Howett was charged with a Section 18 'Wounding with Intent' offence. A hairdresser by trade, he had stabbed a man with a pair of scissors at Basildon rail station on June 24th. He didn't enter a plea at that Magistrates Court hearing. His case was referred to Crown because of its seriousness. A Plea & Case Management Hearing was held once the case got to Crown Court, where Howett entered a guilty plea. On Tuesday he appeared at Basildon Crown to be sentenced for his crime. When I arrived at court, a reporter from our rival newspaper The Echo was already in the building. We both scribbled notes throughout Howett's hearing. Howett had been waiting for a train when three intoxicated football fans had spilled onto the platform, singing and shouting. Howett shouted at them to 'shut up'. Howett claimed one of the men responded with a homophobic comment. CCTV played in court showed that Howett then lunged at the man three times. On the last occasion, he had taken a pair of scissors from his bag. He plunged them, between one and one-and-a-half inches deep, into his victim's back. Had he hit the man's spine - and he wasn't far off - he could have been paralysed or killed. Howett was sentenced to two-and-a-half years in prison. As my paper, the Yellow Advertiser, is a weekly title, the Echo - a daily - inevitably beat us to publication. By the time our paper hit streets, the Echo's report had already been picked up by the Daily Mail. From there it was republished by outlets from France to Florida. Europe's biggest gay news outlet Pink News ran the story. So did US websites Queerty and GayStarNews. Many of these reports were somewhat sympathetic to Howett. Rightly so, you might think. He was a young man on a train platform who simply asked some unruly men to be quiet and was in turn abused over his sexuality. He snapped and plunged pair of scissors into his tormentor's back. It may not be the best way of dealing with the situation, but many might find it understandable. Indeed, much of the user discussion on Pink News was supportive of Howett. "If the 'victim' had kept his mouth shut he wouldn't have been stabbed," wrote a poster called Allex. "What goes around comes around. More of these straight thugs need to be taught a lesson." Another user, B Ingram, wrote, "I'm not a fan of violence but I have to say, as I read more and more stories on would-be gay victims of hate crimes fighting back, I am thrilled." Some posters felt justice was unequal for members of the LGBT community. They suggested that if Howett's victim had instead attacked Howett, his sentence would have been much more lenient. A poster called Adam wrote, "If [Howett] had been stabbed or beaten to a pulp, the men, if caught, may get a fine." Another poster, called Another Hannah, wrote, "This is a sentence which is obviously disproportionate to the sentences given when the boot is on the other foot." However, all of the above articles, which prompted these sympathetic responses, omit what I consider to be a vital piece of information. Here's a copy of my report in the Yellow Advertiser. See if you can spot what was left out of everybody else's stories. 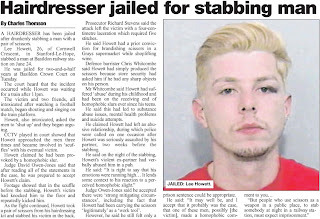 Lee Howett already had another conviction for possessing a bladed article in a public place. That conviction was for using a pair of scissors in a threatening manner. He had been found guilty of brandishing the scissors in a supermarket in Grays. He did so when confronted by staff who had caught him stealing alcohol. He was handed an 18-month community order for the crime. He had various other prior convictions too, including more than one count of assaulting a police officer. Moreover, no evidence was presented to suggest that Howett had actually been the victim of homophobic abuse. It was always Howett's contention, but it was never proved. During Howett's Plea and Case Management Hearing there was talk of holding a Newton Hearing - a trial of issue - to hear evidence on the point and have the judge make a decision as to whether he felt Howett's claim was true. Judge Owen-Jones decided not to hold the hearing. On Tuesday, he said he was prepared to give Howett 'the benefit of the doubt'. In his summing up, he said Howett had 'probably' been the subject of a homophobic remark. That's not quite how many of the outlets who ran the story presented it, though. The Daily Mail's intro read, "A gay hairdresser has been jailed for two and a half years after he stabbed a man with a pair of scissors in revenge for making a homophobic comment. Lee Howett snapped after a passenger waiting at Basildon rail station, Essex, abused him over his sexuality during a series of skirmishes." It is not a matter of fact that Lee Howett was the subject of a homophobic comment. Moreover, the phrase 'abused him over his sexuality during a series of skirmishes' suggests a flurry of homophobic insults, whereas Howett alleged only one, and that one was alleged to have happened before the physical skirmishes - which Howett started - not during. The inclusion of the alleged homophobic slur as fact, coupled with the omission of Howett's prior convictions and the use of the word 'snapped', paint a picture of an innocent bystander provoked into an uncharacteristically violent act by an extreme set of circumstances. The evidence does not fit that picture. The evidence suggests Howett's behaviour was entirely characteristic. He had prior convictions for violence and a prior conviction involving a bladed article. The evidence also does not suggest any extreme circumstances. Being called a single homophobic name is not pleasant, by any stretch of the imagination. But nor is it sufficiently unusual to be held up as an excuse for a stabbing. The Echo report which sparked the global coverage did not mention Howett's prior convictions. I won't criticise the Echo for that. Facts get left out of court stories, by necessity, all the time. To put everything that is said during a hearing like Howett's into a newspaper would be impractical. It would fill half the paper and nobody would read it. The job of the court reporter is to present the salient information to the reader without misleading them or giving undue weight to either party. The Echo may have felt the information wasn't especially important. That is a perfectly valid opinion. All journalism is subjective. I have often quoted Carl Bernstein on the subject. Mr Bernstein once said that the very act of journalism is subjective, because reporters and editors decide what is or is not news. Unless everything that happens in the world on any given day - every flick of a light switch - is reported, then somebody, somewhere has made a decision as to what is or is not news. But I found it interesting how the dynamics of the story were so drastically changed by that simple omission. Coincidentally, when I brought the story back to the newsroom on Tuesday morning, a senior staff member said it was a shame about the prior convictions because without them, it could be a great story about a put-upon gay man who, after years of taunts, snapped and attacked one of his bullies. Of course, we could have taken a decision to omit the prior convictions and write that story - but that wasn't an option we even considered. After watching the story go around the world in the form that it did, it would have been easy to kick ourselves for not simply omitting the prior bladed article conviction and turning the Howett case into the story we wished it had been. The money we could have made! But we had a discussion on Friday and concluded fairly quickly that we had done the right thing.